This sandwich will only be available from April 16 to June 2 in all Jacksonville-area Wawa locations. Now's your chance to eat like Jacksonville native and NFL Hall of Famer Brian Dawkin! He's bringing a taste of his football career to fans in Duval, but only for a limited time. On Tuesday, Dawkin debuted his limited-edition hoagie called "The Dawk Hero's Hoagie" at the grand opening of the new Wawa location, 2500 Monument Rd. It will be available from April 16 to June 2 at all nine Jacksonville-area Wawa locations. Wawa described "the Dawk" to be "a unique creation made by Dawkins himself." "This is the sandwich that I eat every time I come to Wawa," Dawkins said. "... This is the specific way that I put it together." It consists of grilled chicken, parmesan cheese, spinach, tomato, pickles, sweet peppers and honey mustard, all on a wheat roll. 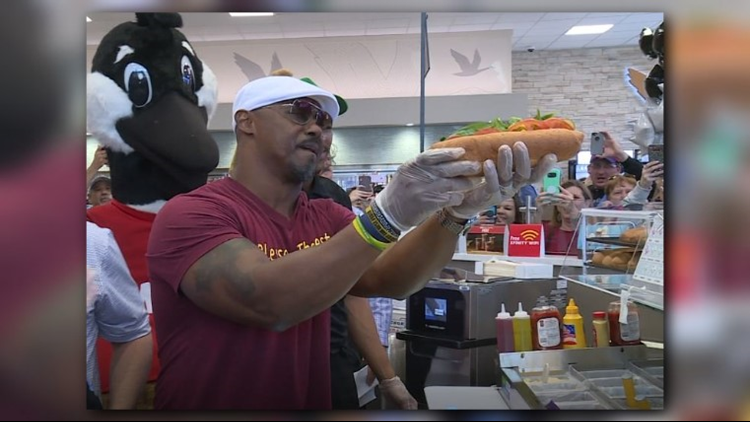 Jacksonville native and NFL Hall of Famer Brian Dawkins makes his special "the Dawk" hoagie at the new Wawa location. It's going to be available at Jax-area Wawa locations for a limited time. 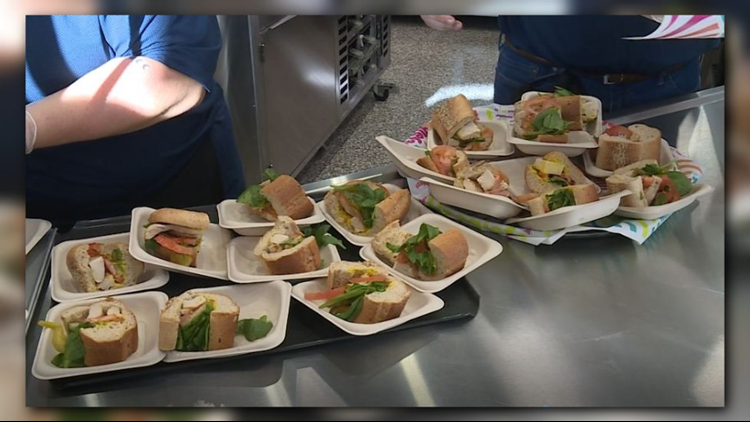 The goal is to donate $20,000 of hoagie sales to the Police Athletic League of Jacksonville, or JaxPal, which aims to reduce juvenile crime and create a positive relationship between law enforcement and the community's youth through educational, athletic and leadership programs. "I think it's very important... to have some opportunities for our officers and community to get to know one another better," Dawkins said. The donation will focus on benefiting its MobilePAL program, which brings the JaxPal program to various communities in town. "It's an opportunity for me to do something to bless this community that blessed me so much," he said. The brand new Wawa on Monument Road offered customers free samples of the limited-edition "Dawk" sandwich.